Before reading this topic, you might find it useful to get familiar with the Template Structure of RadGridView. In order to style all instances of RadGridView in your application, you should create an appropriate style targeting the RadGridView control. To learn how to modify the default RadGridView style, please refer to the Modifying Default Styles article. RadGridView exposes a Style property that allows you to apply a style to a specific RadGridView control. GridLinesVisibility: Control the way by which the grid lines are visualized. You can choose one of the four possible values defined in the GridLinesVisibility enumeration - Both, Horizontal, Vertical and None. ShowColumnHeaders: Shows\hides the column headers. 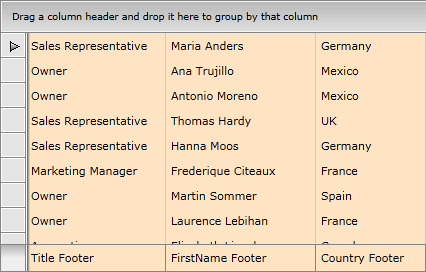 ShowColumnFooters: Shows\hides the column footers. ColumnBackground: Defines the default background color for all columns. VerticalGridLinesBrush: Defines the default color for all vertical grid lines. HorizontalGridLinesBrush: Defines the default color for all horizontal grid lines. Here is a small sample, demonstrating the usage of some of the above properties. You can see that the columns headers are not visible while the column footers are; moreover, there are only vertical gridlines and the background of all columns is set to Bisque. MinColumnWidth: Gets or sets the minimum width constraint of a GridViewColumn. The minimum width of the object, in pixels. This value can be any value equal to or greater than 0. However, System.Double.PositiveInfinity is not valid. MaxColumnWidth: Gets or sets the maximum width constraint of a GridViewColumn. The maximum width of the object, in pixels. The default is System.Double.PositiveInfinity. This value can be any value equal to or greater than 0. System.Double.PositiveInfinity is also valid. ColumnWidth: Gets or sets the width of a GridViewColumn. Here is a small example that demonstrates the usage of some of the above properties. 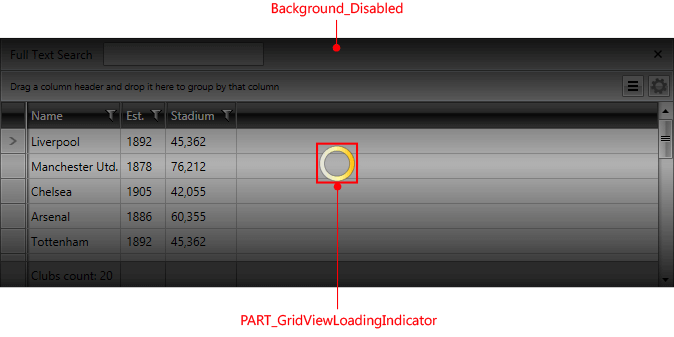 RowIndicatorVisibility: Shows\hides the row indicators, located on the left of each row. RowDetailsVisibilityMode: Controls the way by which row details are visualized. You can choose from one of the three possible values defined in the GridViewRowDetailsVisibilityMode enumeration: Collapsed, Visible and VisibleWhenSelected. AlternationCount: Controls the alternate rows count. For example, when set to 2, every second row will have alternating style applied. You can see that the row indicators are missing and the row details are displayed only for the selected row. Moreover, each even row has different styling because of the AlternationCount property. 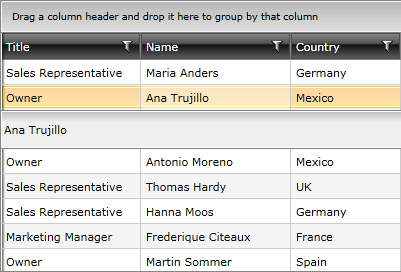 ShowGroupFooters: Shows\hides the group footers, located at the bottom of each group. 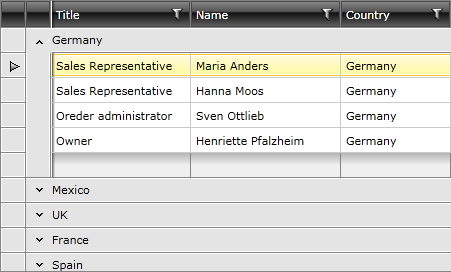 ShowGroupPanel: Shows\hides the group panel, located at the top of the RadGridView control. You can see that the group footers are shown while the group panel (located at the top of the RadGridView) is no longer visible, thus making any changes in the grouping impossible.